Reed Henske is a personal trainer who isn’t sure he’ll ever be ready to date again. He’s sick of guys who are only interested in the perfect body image, never seeing him for who he really is. As Reed tortures Henry with things like diet and exercise, Henry enamours Reed with recipes and laughter. As the friendship lines start to blur, Henry is convinced there’s no way Thor-like Reed could ever be interested in a guy like him. Reed just has to convince Henry that life isn’t about reaching your ideal bodyweight. It’s about finding your perfect counterweight. Some readers collect book boyfriends, while your girl collects book best friends. And the newest addition to that club is Henry Beckett from The Weight of It All by author N.R. Walker. I was suffering through a weeks-long book funk, and this story rescued me. Henry and Reed’s story consumed me, and this was some of the most fun I’ve had with a book in a while. Walker presents real issues in an engaging way, touching on self-esteem and body issues that almost anyone, man, woman, straight, gay, and anyone in between, can really relate to. She tackles these through the lens of Henry and Reed, and I love the fact that she impresses upon us that fat or fit, no one is immune to this problem. Henry is laugh-out-loud funny, has no filter, and I think we would make great friends. 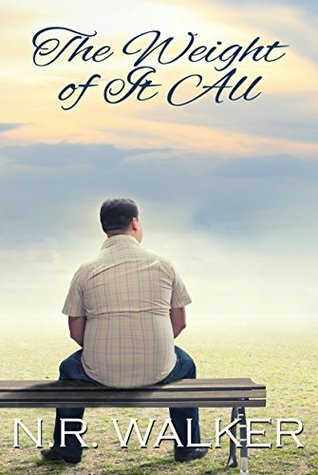 His journey of self-acceptance and love was a pure joy to read. Well, listen to. I adored his interactions with Reed, as well as his circle of friends. I can’t get enough of him. He needs his own web series or podcast or something so I can keep up with him! N.R. Walker tells a sweet and swoony story, a slow burn romance that left me warm and fuzzy. Her storytelling is wonderful; I never felt like I was being told a story. Instead, I felt like I was experiencing everything right alongside Henry. Joel Leslie’s narration is once again top-notch. I would listen to him narrate the copier manual at my office, I swear. (I’d probably finally learn how to work the stapling function) He’s incredibly expressive and delivers such an immersive audiobook experience; I’d be hard-pressed to find someone who tells a story better. If you’re a fan of m/m romance, a fan of true-to-life stories that will warm your heart, I can’t recommend this book highly enough.